Wishing all the folks in the US a great Memorial Day weekend. Also a time to remember all those who sacrificed their life’s for our freedom. 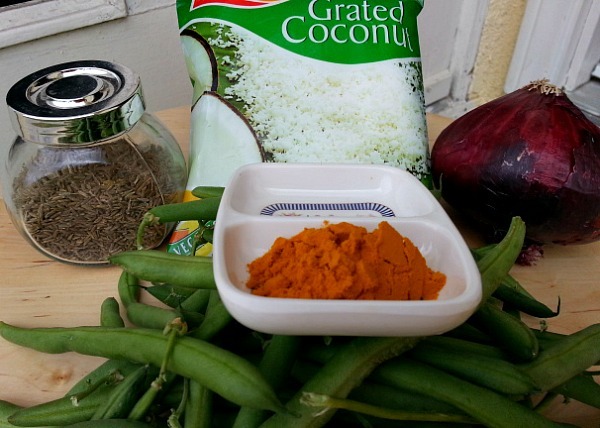 I am looking forward to a chilled out couple days and so I thought I would share a real simple easy recipe of green beans with grated coconut for the veggie part with all the barbecued meats we will be eating. Heat oil in a pot, add the chopped onion saute till translucent. Add the turmeric and cumin and saute for a 1-2 minutes. Add the chopped green beans, water and salt to taste and cook covered on medium heat till beans are soft about 15 to 20 minutes. Check occasionally and stir so it does not stick to the pot. 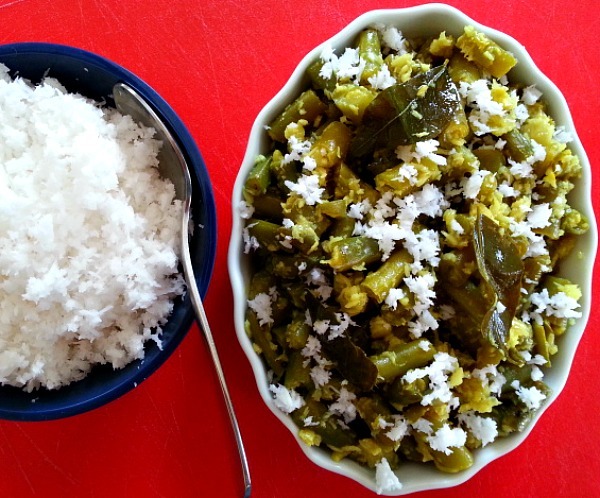 Next add the thawed coconut and curry leaf (optional) stir and cook for 3 minutes. Serve as a side with rice or bread. Love your vegetables, then check out my other recipes for vegetarian options. Since my quest for carb cutting is always an ongoing process. I have been recently eating my curries by substituting my rice with cooked chopped green beans and it has been a great alternative. As green beans has fiber it holds a bit longer then plain old salad. I would have never thought to combine these two things together. It looks amazing! I’ll have to try it. Thanks Diana :-). I grew up eating it quite often the coconut gives it a light sweetness. That sounds like an amazing combination! And one that has never occurred to me before. I may have to try this! I hope you do :-). The coconut gives it a subtle sweetness.